Posted on January 29, 2019 at 12:54 pm. 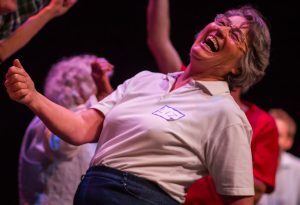 The 19th Season of GeriActors is well underway and this season has been filled with new opportunities, audiences, and stories. Read on for more information on our wonderful student volunteers, the GeriActors & Friends performance season, and an upcoming workshop! 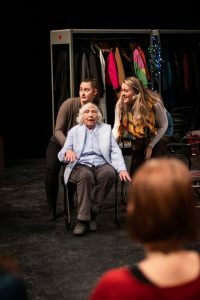 Student Volunteers – In September, the GeriActors & Friends were joined by 14 students all enrolled in Intergenerational Theatre through the University of Alberta. Every fall students collaborate with the GeriActors to develop new material based on true stories and issues of concern. We presented developing material at our annual holiday celebration on December 11 including stories about Holland during the second world war, a classroom bully, an ode to plastic recycling, and women’s rights. New Audiences – In October and November, the GeriActors & Friends had the opportunity to perform for the Age Friendly Edmonton 2.0 Leadership Table, University of Alberta’s Geriatric Medicine (as part of their SHAPES program), and in Vegreville for their Health and Wellness Day. We are currently booking for our spring tour from May to June 2019. Contact us book a performance at your centre, residence or event. 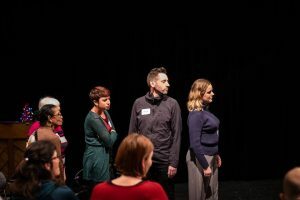 The Senior Actor – Learn the Storytelling & Performance techniques developed by GeriActors in The Senior Actor workshop series starting March 8.